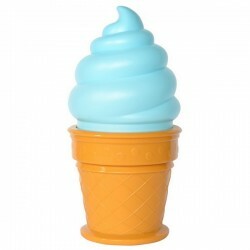 This Ice Cream Light is a perfect decoration for every kids room, for boys and girls.There´s always room for ice cream. It is a battery operated LED light with a push top function, it requires 3 x AA batteries which are not included. Packed in gift box with a cute ice cream allover print, on top the text, there´s always room for ice cream.